The southern-most region of South America, Patagonia is shared by Argentina and Chile and is the perfect spot to visit for adventuring in the great outdoors. From glaciers, mountains and lakes to whales, penguins and fossilised dinosaurs—there’s something to suit all interests! To help you get there fast, we’ve partnered with the American Express Explorer Credit Card. Perfect for avid travellers, with the Explorer Credit Card new members can take advantage of 50,000 bonus Membership Rewards points when they apply online and spend $1,500 in the first three months of the card approval date, as well as a $400 travel credit and two Sydney International Airport lounge entries per year. Now that’s how you travel in style! 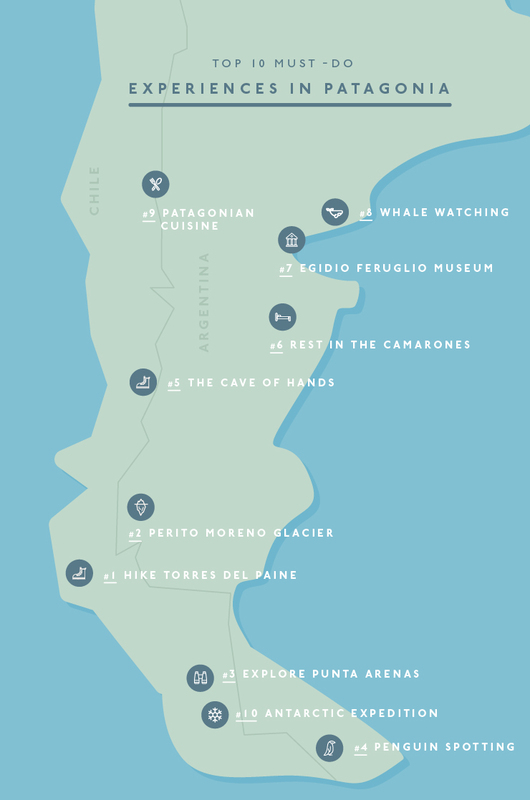 Without further ado, here’s the first-timer’s guide to Patagonia, time to get booking. With glaciers, rivers, mountains and lakes, Torres del Paine is a Patagonian national park right out of a J. R. R. Tolkien story. It could quite possibly be the most spectacular place you’ll ever see. Due to Patagonia’s frigid winters, the best time to visit is in the warmer months between October and April. A two-hour bus ride from El Calafate, Glaciar Perito Morena is one of the most unique glaciers in the world due to the fact that it’s advancing rather than receding like all others. It’s a spectacular sight. The best way to visit this amazing spot is with a guide, this full day tour which includes a one-hour boat ride on a glacial lagoon is one of the best. Perched on the Chilean side of Patagonia, Punta Arenas is a gorgeous, relaxed and friendly South American city. European architecture abounds as the area used to be a thriving seaport. The perfect stop-off point on the way to Tierra del Fuego and Torres del Paine, be sure to stop by the fascinating Cementerio Municipal, Plaza Munoz Gamero and Chile’s oldest brew house, Austral Brewery. Being the closest point in the world to Antarctica, Patagonia is one of the best places for some hard-core penguin watching. Home to Magellanic, Humboldt, Gentoo and King penguins, the best time to catch them is between September and April in Tierra del Fuego. Swoop offer a range of penguin and other wildlife encounters ranging from day trips to week-long voyages. Cueva de la Manos is Spanish for Cave of Hands, which is exactly what you will find there—in hand print form, as well as depictions of animals and hunting scenes. The artwork in the cave is thought to be up to 13,000 years old—it will certainly make you stop and think about how far we’ve come from those caveman days! Cueva de la Manos also offers a pretty speccy view of the Pinturas Canyon. If you’re in need of a little R&R head to Camarones, a sleepy fishing town on the east coast of Argentina. Aside from relaxing, you can take part in fishing, diving and various other water sports, as well as hiking. We vote for relaxing, though. In prehistoric times, Patagonia was teeming with dinosaurs and they’ve left behind some pretty incredible fossils. There are paleontologic sites and museums all over Patagonia like Egidio Feruglio Museum, click here to find out more. 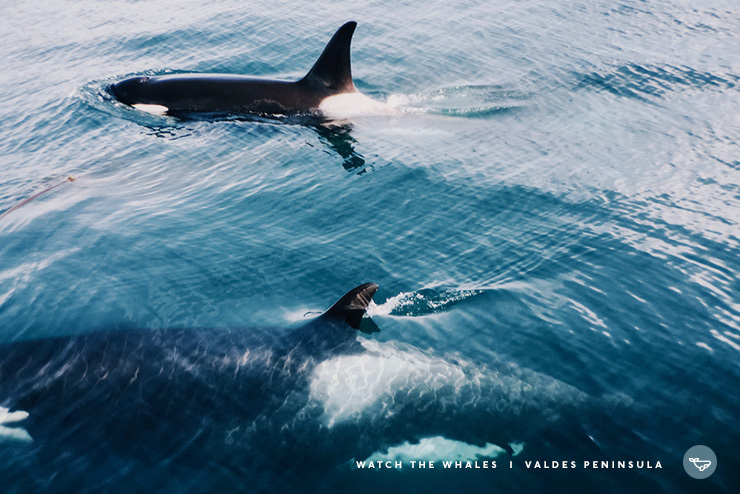 The World Heritage Listed Valdes Peninsula is the perfect lookout point for southern right whales, as well as elephant seals, sea lions, magellenic penguins and killer whales. The best time to go for a chance at spotting these wonderful mammals is September through to March before they make their migration to Antarctic feeding grounds. Yellow Submarine offer whale watching tours in their semi-submersible subs that give you the chance to watch these creatures above and below the water. 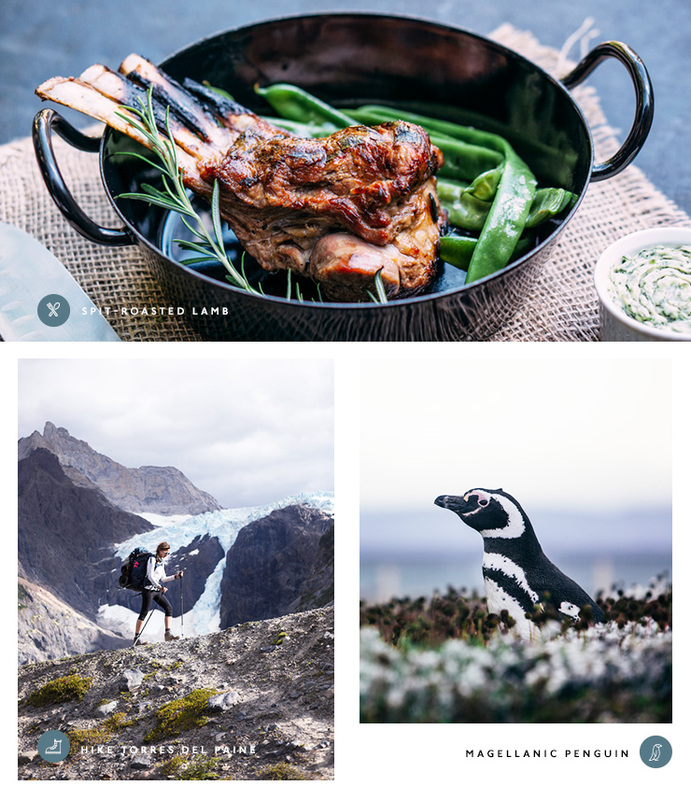 From spit-roasted lamb and king crab pie, to the melted cheese goodness that is raclette and trout pate, Patagonia is one of the best places to step out of your foodie comfort zone. If some of this doesn’t appeal to you, don’t worry, you’ll also be able to get your hands on loads of empanadas! If an Antarctic adventure is on your bucket list, the best time to go on one is when you’re in Patagonia as it’s the world’s closest land point to the icy cold continent. Aurora Expeditions offer a very comprehensive cruise to Antarctica, where you can partake in everything from sea kayaking and scuba diving to polar snorkelling. Patagonia covers a lot of ground in Chile and Argentina, so you can expect to hotel hop. Whatever you decide, there’s no shortage of places to stay and American Express make booking easy—click here to see how! The best place to stay if you’re headed to the glacier, Esplenor El Calafate is your cosy, cabin-like home away from home overlooking Lake Argentino. With panoramic views of the Patagonian Andes, Hotel Costaustralis is a chateau-style hotel with all of the modern luxuries. A five-star luxury hotel in the Chilean town of Puerto Bories, you’ll likely never want to leave The Singular Patagonia and its stunning view. Getting to Patagonia is no easy feat, you have to take a couple of flights from Australia to get to Buenos Aires, from there you’ll be able to hop on a flight to the first stop on your Patagonian itinerary. Patagonia experiences the same seasons as us, except things can get a lot colder in the winter months, depending on where you are. In summer, the days are long and the temperatures are pleasant, but it can get a little busy with tourists. The best time to visit is during the shoulder season in autumn and spring. As Patagonia is made up of Chile and Argentina, the currency is either the Chilean or Argentinean Peso, depending on where you are. Spanish, Mapuche and Patagonian Welsh are all spoken in this region, as well as English and loads of other Spanish dialects. Tehuelches were the native people of Patagonia. Described by European explorers as giants, they were said to stand up to 15 feet high, a myth which was disproven in the eighteenth century. Patagonia is massive, so if you want to do this region properly you’ll need to carve out a decent chunk of time!